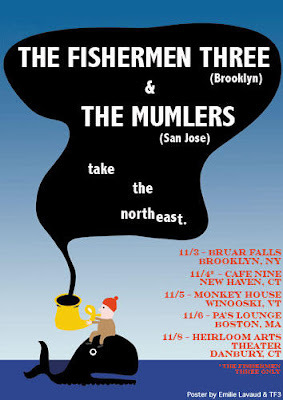 The Fishermen Three, from Brooklyn, spent much of 2009 touring in Europe to support their debut album, Rosina on Every Balcony, released on Hype City, a Norwegian label. Most recently, they were on tour with the Jeff Lewis Band in the UK. This is a rare chance to see them in the US. From San Jose, California, The Mumlers are a young and exciting band with one of the best horn sections around. Towering frontman Will Sprott will win you over with that voice of his immediately. See this month's New Yorker for a description of their NYC show. Also playing are local acts The Proud Flesh and Ryan Stottle.